Image of Virgin Mary, Book of Hours, Syracuse University. During the Medieval, one of the significant events in the literature is the appearance of Virgin Mary. She became a very important figure, as well in the art; for example, the Book of Hours is a private book that contains illustrations, and is designed for the purpose of recitation in the monasteries; later it became a wedding gift to the women. There variations of this book, depending on the patrons; however, always carries any page about Virgin Mary. 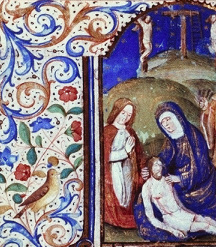 In the exposition The Power and the Piety, held this spring at Syracuse University, I found an image of Virgin Mary kneeling in front of baby Jesus, belonging to a book of hours. This book hence is related to the piety. According to the flyer about this exposition, the book contains ‘vibrant illuminations of the passion of Christ and the life of Virgin Mary’. The book includes The Book of Virgin, which is the liturgical oration of her. In the literature, the mester of clergy started writing highbrow texts. The poems about the miracles of Virgin are representatives of the mester of Clergy. Gonzalo Berceo wrote a well-known book of poems, of title Miracles of Our Lady, not only example of the piety, but also the power of Virgin Mary. The Book of Hours and the poems of the Miracles of Our Lady indicate a link of the power and the piety of Virgin Mary. Powerful Virgin, Book of Hours, Syracuse University. "I, Master Gonzalo Berceo, while on a pilgrimage happened to pause in a meadow green and untouched, full of flowers –a desirable place for a weary man." In first place, the page’s decoration, where Virgin Mary appears, is corresponding with the description of the landscape that Gonzalo Berceo wrote in the introduction of the Miracles of Our Lady. In the beginning of his pilgrimage, he describes the landscape in detail. He stopped in a green field where he saw flowers and fruit trees. Like his description, the page, surrounding of the picture, includes the fruit trees and the flowers, roses. Also, Gonzalo mentions the nightingales that sing in the field and like in this scenery, a nightingale is shown in the page, under the figures of Jesus and Virgin Mary. When you see the image, you can find the same elements to the landscape of his pilgrimage. In the respect of the power, according to the introduction of the Miracles of Our Lady, Gonzalo describes Virgin Mary as powerful queen. Gonzalo says, she is watched by mariners in peril for when they see her, their ship is guided. Here Virgin Mary is described as a protector because she has the power to guide the people who are put into dangerous situation. Moreover, he says, may the Glorious One guide me so that I may complete the task; Virgin Mary is a figure which gives him the energy –the power in order to complete his pilgrimage. "She is the Sling with which young David destroyed the ferocious giant." On the other hand, Gonzalo indicates the piety of Virgin Mary. He says this meadow was always green in purity for her virginity never was sustained, which means her purity and how she is so. Also, she is the source of four steams, the evangelists, Matthew, Mark, Luke and John. Therefore, she represents as a medium between god and people. 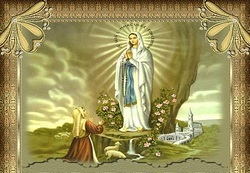 The Virgin Mary says that she prays for sinners day and night. Whoever that is, she embraces every person. To save and to be compassionate towards the sinners is a part of the Catholic doctrine. 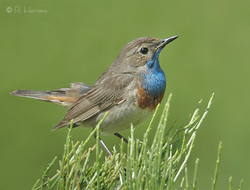 According to the text, Gonzalo keep mentioning the nightingales singing. And the relation with the hours of Virgin, I carefully assume that it is therefore composed with some hymns and psalms. Medieval Poem of Saint Mary, "Cantiga"
Without doubt, the common element between the books of hours and the Miracles of Our Lady is Virgin Mary; the two works show the Mariology in the Middle Age. Although the exposition only shows a small image, you can see the importance of her piety. At the same time, the poem delivers more explanations than the painting, emphasizing the power of the Virgin Mary.